Osaka – Hematopoietic stem cells (HSCs) are a class of stem cells located in bone marrow. HSCs give rise to every type of blood cell–from the red blood cells that carry oxygen to the white blood cells of the immune system. Bone marrow provides a niche that both houses and regulates HSCs to ensure proper formation of blood cells. However, the precise mechanisms that maintain the HSC niche are not fully understood. 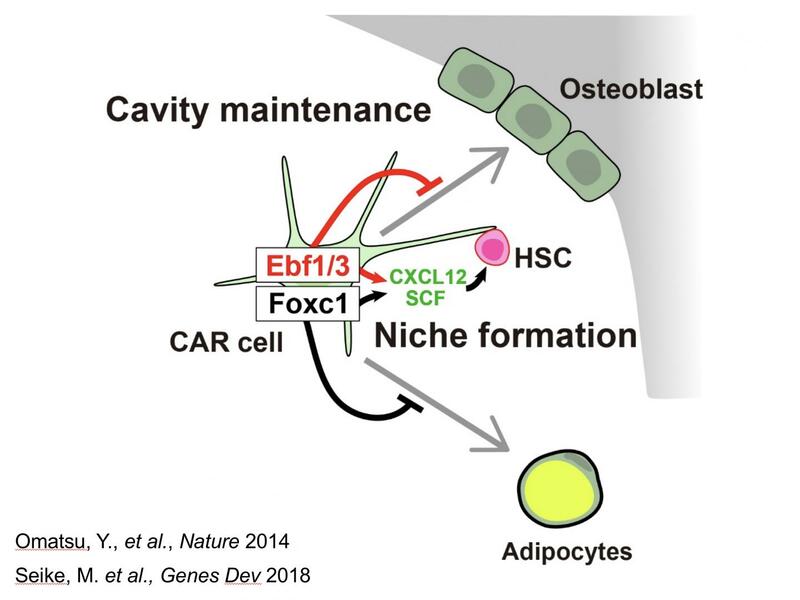 Now, in a new study published in Genes & Development, researchers centered at Osaka University report they identified a key cellular protein involved in maintaining the bone marrow cavities and the HSC niche. The HSC niche is a microscopic, specialized environment located around blood vessels within the bone marrow. A wide array of cells and molecules have been found to reside in the niche and play a role in regulating HSCs. The researchers were especially interested in one particular cell type: chemokine ligand 12-abundant reticular (CAR) cells. "Several lines of evidence from prior studies pointed to CAR cells as having a crucial function in the HSC niche," lead author Masanari Seike explains. "We wanted to take a closer look at specific proteins expressed in these cells, to really pinpoint what the cells were doing in the niche." The researchers found that a protein involved in regulating gene expression, called Ebf3, is highly abundant in CAR cells of mice. When they removed the gene that produces Ebf3 from these cells, they saw a significant decrease in the number of HSCs in the bone marrow–as well as some other, more surprising effects. "In the absence of Ebf3, the stem cell population dropped fairly sharply, consistent with CAR cells playing a major role HSC regulation," Seike adds. "What we didn't expect was the impact the removal would have on the shape of the niche itself. We found that bone density increased dramatically, essentially filling in the cavities that form niches. It appears the Ebf3-deficient CAR cells take on bone-synthesizing properties, similar to osteoblasts that typically make bone. We believe that CAR cells need Ebf3 to create the physical and molecular environment that ultimately becomes the HSC niche." The central role of Ebf3 in correctly balancing bone formation in the niche has significant clinical implications, and Ebf3 may eventually become a target of therapeutic interventions. "Our findings suggest that drugs which modulate the activity of Ebf3 could have substantial clinical value," lead investigator Takashi Nagasawa notes. "On the one hand, Ebf3 inhibitors may be able to increase bone mass in diseases like osteoporosis. On the other, Ebf3 activators may allow for the fine-tuning of HSC niches, which would improve the effectiveness of regenerative therapies that allow patients to use their own stem cells. We hope this discovery opens up exciting new areas of exploration in both directions."